Lovely dress and especially like the brooch. cute bike hanging thing - is that what it is? Adorable jumper! I like how you winterized it with the turtleneck and boots. Lovely bee pin as well. I'm glad you saw the potential in this dress despite its original size. What a great dress! 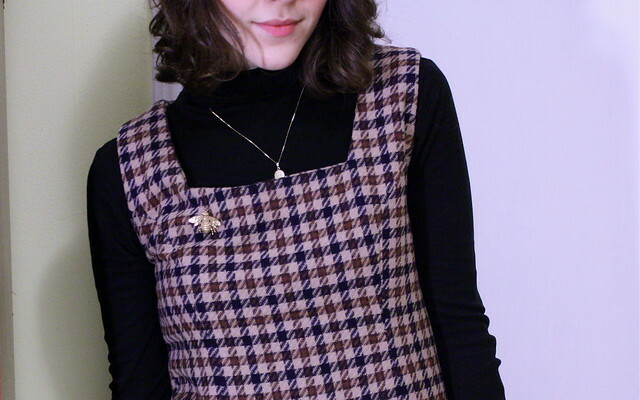 That bee brooch is, wait for it, the bee's knees. I guess it's not a pun if I'm wrong and it's actually some other insect, but it's still adorable. A great find, I love the colours too - such a gorgeous dress! That's a great dress, good find! And I would like to say, thank you for not posting five millions pictures of the same outfit when you do outfit posts. There was this blogger that I actually thought was a reallly sweet person, but I unfollowed her the other day because there were literally 15 pictures on her outfit post. Of the same outfit. Basically the same photo. Too much! I couldn't take it anymore! very cute dress! 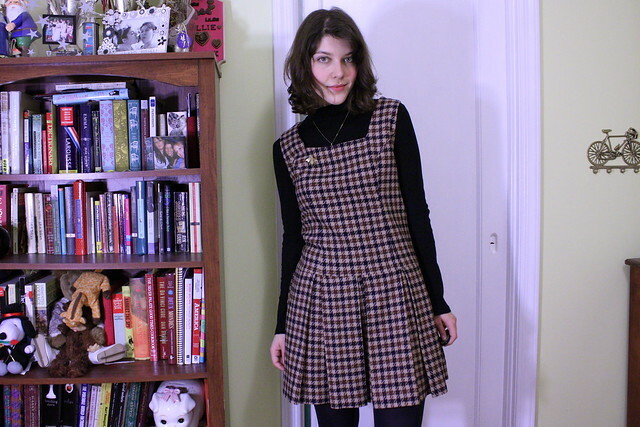 I love houndstooth and plaid from the 60s. I'm always snatching it up when I see it. Also that bee pin is adorable! Whenever I see green sweater vests at the thrift store I always want to buy them all for you hahah. I love your vintage dress! It was definitely worth altering. 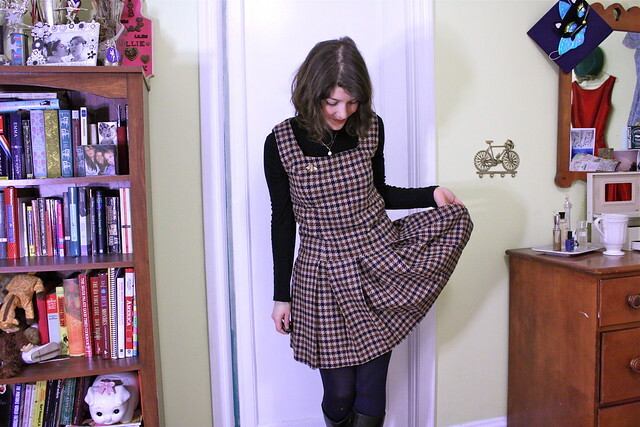 The brown and navy plaid is fantastic and I'd imagine it's really versatile. 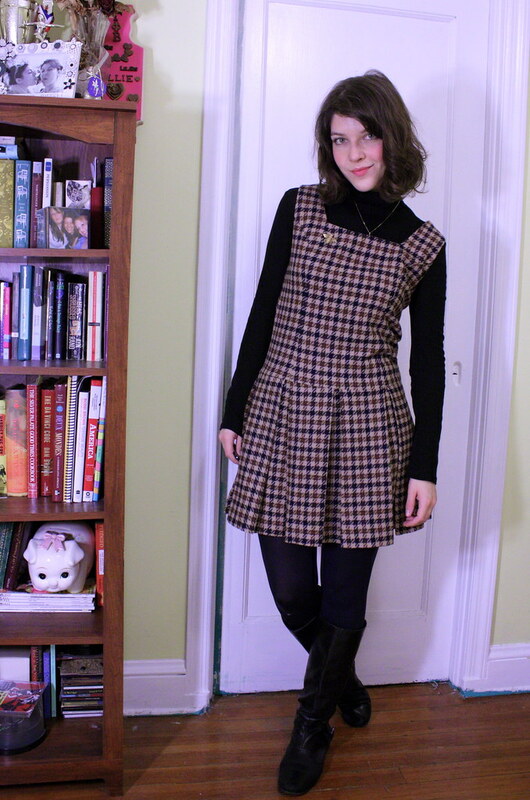 i love the vintage dress it is so school girl cute! OH MY GOD! That dress is so perfect and lovely and amazing. The colours are gorgeous and I adore the pleats. What a great find. You seriously rock. I love you so so very much! Thank you for all of the sweet comments and such on my blog!